Triple kit celebrating the 50th anniversary of the Italian PAN aerobatic demonstration team: Aermacchi MB-339 advanced jet trainer, Fiat G.91 fighter-bomber and Canadair F-86F transonic fighter - all in service with the Pattuglia Acrcobatica Nazionale 'Frecce Tricolor' of Italy's Aeronautica Militare. MB 339 has raised panel lines, basic tandem cockpits, boxed in wheel wells and 2-piece canopy. G-91 has recessed panel lines, basic cockpit, boxed-in wheel wells and 2-piece canopy. F-86 features recessed panel lines, basic cockpit, partial intake trunking, boxed-in wheel wells, optional position speed brakes and 2-piece canopy. 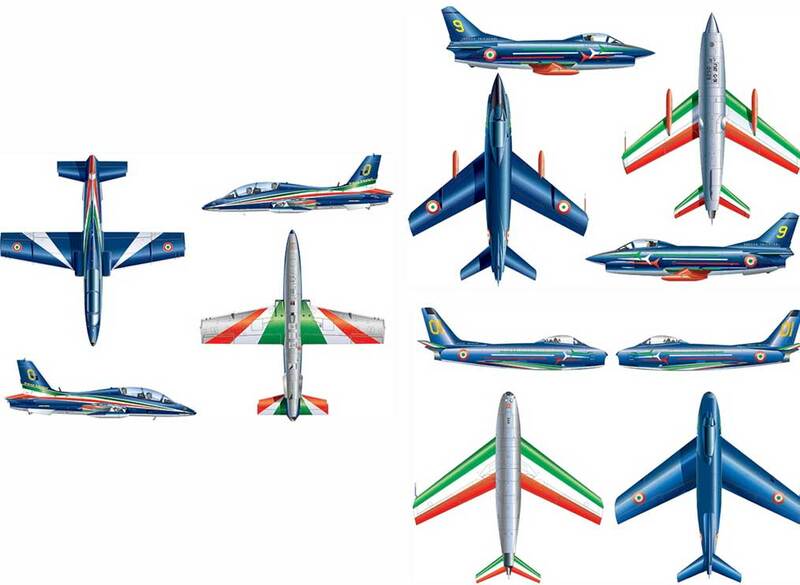 Each aircraft features decals and painting reference for multiple 'Frecce Tricolor' aircraft: MB-339 (choice of 1 of 11), 2010; G-91 (choice of 1 of 10), 1964-1981; and F-86 (choice of 1 of 9), 1961-1963 - includes wing, stabilizer and fuselage livery. The Tornado was the result of a collaborative project between three countries (the UK, Germany and Italy) aimed at developing a bomber able to operate in TFR (terrain following radar) mode, flying at low level over uneven terrain. 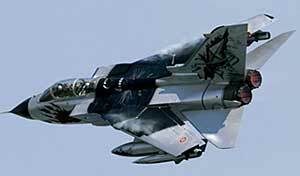 Despite a series of problems that were more political than technical, which delayed its deployment, almost 1000 Tornado IDS planes were built and it turned out to be an excellent machine in action, both during the Gulf War and in the operations in the former Yugoslavia. Today, about 750 Tornado IDSs remain in service with the nations of the consortium that built them and with Saudi Arabia. Tornado IDS with 'Black Panthers' Special Colors. Panavia-built variable geometry twin-engine attack aircraft kit. Features recessed panel lines, detailed cockpits, pivoting wings, weapons pylons and stabilators, optional position speed brakes, 2-piece canopy and extensive external stores. Aeronautica Militare Italiana 50 Stormo, 155 Gruppo, Piacenza, Italy, 2007 - ceremonial Black Panther scheme. Royal Air Force No 9 Squadron, BrÃ¼ggen, Germany, 1985. Royal Air Force No 31 Squadron, BrÃ¼ggen, Germany, 1991. Luftwaffe Jagdbombergeschwader 33, BÃ¼chel, Germany, 2007. 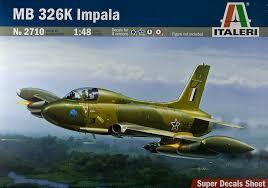 North American-built transonic jet combat aircraft model kit. Features recessed panel lines, basic cockpit, boxed-in wheel wells, optional intake and exhaust covers, multi-part canopy, optional position speed brakes, and drop tanks. Includes Skyblazers Aerobatic team badge. Ex-ESCI mold. Includes stencils, instrument panel and console markings. 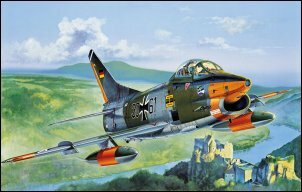 Developed in the early 1950s to participate in the NATO tender for a lightweight fighter, the G.91 was designed by Giuseppe Gabrielli (who also designed the Fiat G.55) who drew his inspiration from the F-86 Sabre, then produced under license by FIAT. 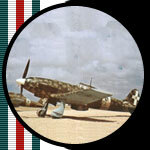 While there was no follow-up to the NATO tender (won, as it would turn out, by the G.91), the aircraft nevertheless went into production and was ordered by both the Aeronautica Militare Italiana and the Luftwaffe; some G.91s were subsequently ceded by Germany to the Portuguese air force and it was here that they first saw action during operations in Angola. 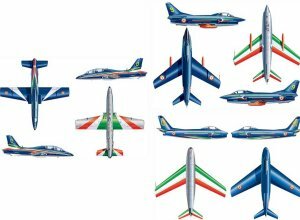 With the Aeronautica Militare Italiana the G.91 had a long career with both operative squadrons and the country's aerobatic team, the Frecce Tricolori. The last planes were withdrawn from service in 1992. Contains decals for Italy, Germany and Portugal. This small, maneuverable trainer, used by pilots to make the switch from propeller aircraft to jets, was built for the Italian air force in the late 50s/early 60s. Simple and tough, extremely maneuverable and easy to fly, it soon became one of the Italian aeronautical industry's "best sellers", enjoying considerable export success. Several versions of the MB 326 saw service with the Australian and South African air forces. There, as in Italy, it has only recently been replaced by more modern Macchi aircraft. The MB.326 was also used in combat by the Argentinian Air Force. Markings for four aircraft: Australia, South Africa, Argentina and Italy. Iconic trainer/light attack aircraft heavily produced in South Africa and elsewhere under license, was successfully employed in the attack role during the border war with Angola and even used by the the South African acrobatic display team and only recently was decommission in 2005 after more than 40 yrs of sterling service. 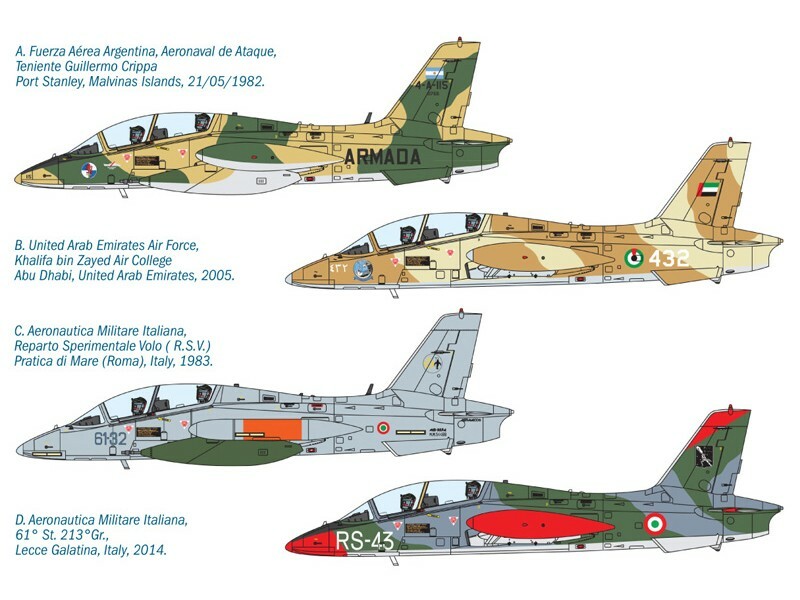 Markings for six aircraft: 3 x South Africa, 1 x UAE, 2 x Italy (AMI). 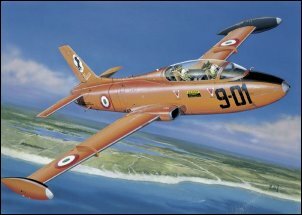 The Aermacchi MB-339 was developed as a direct evolution of MB-326. The MB-339 project was in fact based on the main aerodynamic characteristics of its predecessor, enhancing the role of advanced military trainer through the redesign of the forward fuselage to raise the instructionâ€™s seat and to increase visibility. Thanks to its maneuverability, the good operational flexibility, and the possibility to load a wide range of weapons in its hard points under the wings, the MB 339 has also been developed to perform light attack and close support duties. 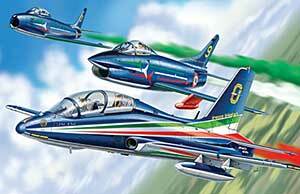 The Italian Air Force is the main user of the MB-339 as advance trainer plane. 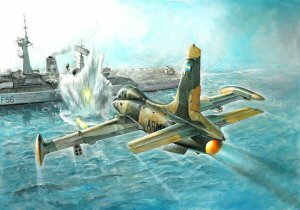 Furhter more the MB-339 has been used by Argentine Naval Aviation, as light attack fighter, during the Falkland / Malvinas War in 1982. Merlin HMA.1 Royal Navy. Jointly developed/built by Agusta and Westland, the EH.101 is undoubtedly today's most advanced medium helicopter. Powered by three General Electric CT7-6 or Rolls-Royce Turbomeca RTM322 turbines (each fueled by its own self-sealing tank), it features a main 5-blade rotor made of composite material that, thanks to a special anti-vibration system, ensures extremely silent running. Five nations (United Kingdom, Italy, Canada, Denmark and Portugal) have chosen the EH.101 Collaboration with Lockheed-Martin has also led to the founding of team US101, which won the tender for the new US Presidential helicopter Marine 1. 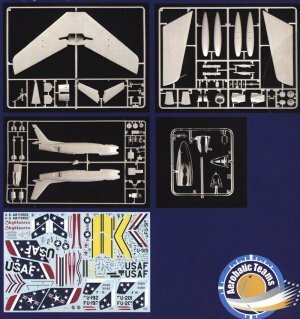 Includes: decals, instruc, clear canopy, markings for one Royal Navy helicopter. 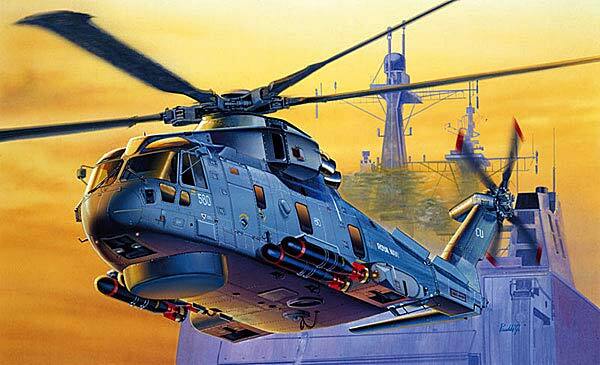 The EH-101 was designed and built by a partnership of Agusta of Italy and G.K.N. Westland of Great Britain (now part of the Agusta consortium). It first took to the air in 1987 and now equips the R.A.F. and Royal Navy as the EH-101 Merlin, the Canadian Armed Forces as the EH-101 Cormorant and of course the Italian Navy. The EH-101 has also been ordered by Denmark, Portugal and Japan and was offered to the U.S.A. as the US-101. The U.S. Marines have now selected it as a replacement for the VH-3D as "Marine One", used by the President of the United States. It will enter into this role in 2009. 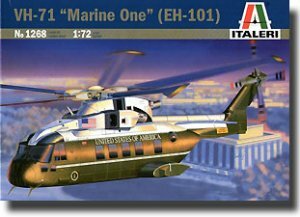 Contains decals for EH-101 "Marine One".